During the first hand each player has only one card at their disposal; from hand to hand the number of cards increases by one. In each hand the players endeavor to achieve as many points as possible. The player who was able to collect the most points after 10 hands is the winner. All the cards are shuffled well. Then cards are dealt to each player so that nobody can see them. The number of cards changes from one hand to the next. In the first hand each player receives only 1 card, in the second 2 cards etc. until in the tenth and last hand each player is dealt 10 cards. Throughout the game, as many rounds are played as the players are holding cards in their hands. Example: it would not be possible to win 5 tricks if you are holding cards as there will only be four rounds. In each round every player has to out one card openly, one after the other. This is called a "trick". After dealing, each player looks at their card(s) and thinks about how many tricks they will win with this/these cards. To be able to see better, please remove all eye patches. As a sign that a player has decided on the number of tricks, they stretch a fist out towards the centre of the table. When all the players are holding up their fists towards the middle of the table, they utter the pirates' battle cry "YO - HO - HO". As they do so all the players raise their fists and hammer them on the table with each word of the pirates' battle cry. With the second "HO" the players all open their fists at the same time and stretch out as many fingers as the tricks they want to win in that round. Note: Anyone who thinks they are capable of winning more than five tricks stretches out five fingers, at the same time naming the number loud and clear. The bids for each player are noted down in the narrow column on the notepad. The player to the left of the dealer begins the round by playing the first card. Clockwise the other players must follow the suit already played. This means playing a card from the same suit. Any player who can't follow suit plays a different one (and loses the trick) or a skull and crossbones flag (to win the trick if possible). When all the players have played a card they can see who gets the "trick". The player who has won the trick places it, facing down, in front of them, each trick separate from other tricks (enabling everyone to see clearly how many tricks the respective player already has), and then plays the first card of the next round. When all the cards have been played, the hand comes to an end and the scores are noted down. Which cards are there and which card wins the trick? It is always the player who has played the highest card that wins the trick. It is always the highest card of the suit being played. If other cards from other suits are played than the first card played (because the player doesn't have the suit) their value is irrelevant. Exception: Th e skull and crossbones flag (black) is the highest suit and it trumps all other suits (irrespective of its numerical value). All other suits rank equal to one another. Example: A "Yellow 2" is played, followed by a "Yellow 12". Th e next two players don't have any yellow and play a "Blue 13" and a "Black 1". Th e "Black 1" wins the trick because black is always the highest suit. Without the black card the "Yellow 12" would have won the trick because it was the highest card in the suit (yellow) being played. This card is worth "0" and is always the lowest card. It is played in order to not win a trick. However, if all the players play an "Escape" card, the trick is won by the player who played the first Escape card. crossbones flag), but is trumped by Pirate cards. It is also higher than the Skull King because the latter lets himself be beguiled by her: If the Mermaid is in the same trick as the Skull King, the Mermaid always wins the trick (no matter which other cards are also in the trick) and the player receives an additional bonus. These cards are higher than all the cards of a suit (irrespective of the suit or value) and the Mermaid. It is played after another Pirate card. It is trumped by a Skull King played later, or it is played after the Skull King. It is trumped by a Mermaid played in the same trick as the Skull King. The Scary Mary can be played either as a Pirate card or as an Escape card. When playing this card the player says in which function he wishes to use the Scary Mary. The Skull King can only be trumped by a Mermaid. All other cards are lower than the Skull King. 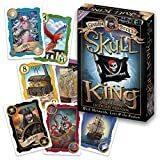 If there is a Pirate card in the trick which is won with the Skull King the (one of them is also the Scary Mary, no matter how it is used), the player gets a bonus. Again, as a reminder: Special cards can be played at any time! Even if it is possible to follow suit! If the first card played is a special card, the next suit card to be played determines the suit to be followed for the further round. If the first card played is a skull and crossbones flag (black) a player who has no skull and cross- bones flag in their hand can play a card from another suit. They do not have to play a Pirate. If 2 Pirate cards are played in a round, the card first played is higher and wins the trick. If 2 Mermaid cards are played in a round, the card first played is higher and wins the trick. A player who bids their number of tricks correctly receives 20 points per trick that they have won. Example: David bids 3 tricks which he indeed gets. He receives a total of 60 points. A player who wins more or fewer tricks than bid, receives no plus points and no bonus points. They receive 10 minus points for each trick more or less than their bid. If a player bids for "no tricks" and manages not to make a trick, they receive points corresponding to the current round, multiplied by 10. Example: In round 4 Eloise makes a bid to win no tricks. At the end of the round she has actually managed not to win any tricks. She receives 40 points for this (round 4 times 10 points). However, if a player does not manage to do this, and is forced to take one or more tricks, they receive the same number of points, but as minus points. If a player bids "no tricks" and proves to be wrong, it is irrelevant if they get one or, for example, three tricks. Example: In round 9 David makes a bid to win no tricks. But in the course of the round he had to take two tricks. He receives -90 points for this (round 9 times 10 points). So a no-trick bid is also risky! It can mean that a player wins lots of points, but they can also lose a lot. Th Bonus points can be won UK with cards bearing gold coins in the symbols. However a player can only win bonus points if they manage to get exactly as many tricks as their bid. If a player doesn't manage to do so, no bonus points are awarded. If a player catches one or more Pirate cards in a trick with the Skull King, that player receives a bonus of 30 points for each Pirate card in the trick. The Scary Mary always counts as a pirate even though she was played as the "Escape". 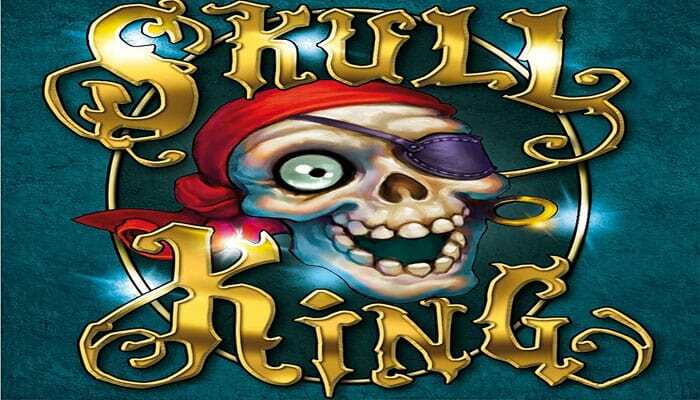 If a player has caught the Skull King with his Mermaid in a trick, he receives a bonus of 50 points for it. The number of tricks bid and the points scored are noted on the notepad. This job is best done by a player without a hook for a hand. After a hand has been played and the scores written down, all the cards are shuffled again and dealt again for the next hand. The number of cards increases by one from one hand to the next. The game ends after 10 hands. The player with the highest score has bid cleverly, trumped success- fully and won the battle.